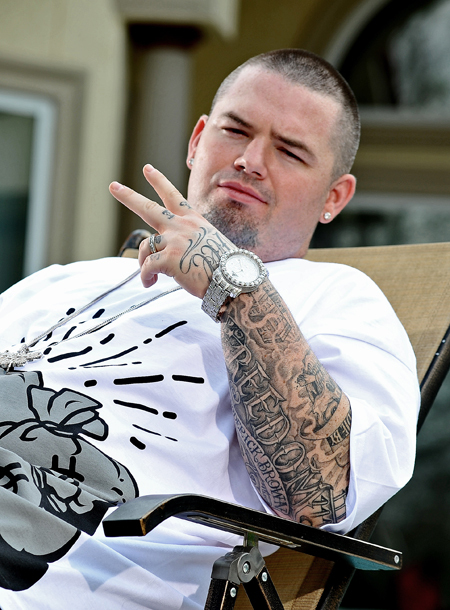 Born and raised in Houston, Texas – Paul Wall marches to the beat of his own 808. Known as one of the new generation of Lone Star Stateâ€™s rap luminaries alongside the likes of Lil Flip, Slim Thug and his former partner-in-rhyme, Chamillionaire, Paul has paid his dues and then some. Over the last decade, Wall has worked his way up through ranks, linking up with Travis Barker and Skinhead Rob to form Expen$ive Ta$te, helping to bring the legendary Swisha House record label to the attention of the mainstream and making a name for himself supplying his fellow rappers with diamond encrusted grills. With his third major label offering, Fast Life, due in late Spring, we caught up with Paul Wall to talk about his rise in the scene, his plans for the future, his relationship with the infamous tattoo artist Mister Cartoon and his own ink. Format: Hey howâ€™s it going, you ready to get things started? Paul Wall: Yeah, Iâ€™m all ready. Format: Youâ€™ve been busy working on some big projects lately, whatâ€™s been cooking? Youâ€™re forever involved with something or other. Paul Wall: Well, I have a new album coming out May 12th 2009, so Iâ€™m just getting ready for that. Itâ€™s called Fast Life. We just shot the video for the first single last week, itâ€™s called ‘Bizzy Body’. Format: So is there a specific theme or focus on this record? 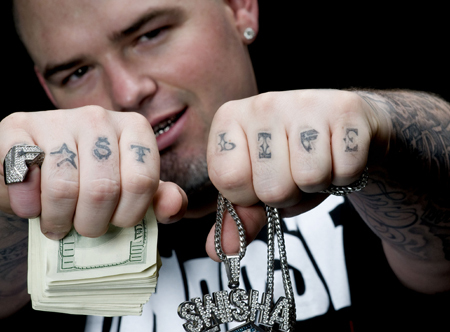 Paul Wall: Yeah, the theme of the album is just the â€œfast lifeâ€ theme, y’know? You hustle and bustle and grind to try and get it, try to get that paper. Chasing after paper from sun up to sundown. And the music kinda reflects that, y’know? Itâ€™s grind music! Format: Were there any collaborators on this album? Paul Wall: Yeah, Travis Barker did a lot of the production, also Beans and Cornbread. We also got Too $hort on there and Young Joc and some of my Texas homeboys too. Format: Youâ€™ve been involved in just about every aspect of the business, from street teams to producer and everything in between. What drives you to be so involved? Paul Wall: The main part of it is that you got to work, you got to grind, you got to get it. I think there are some – a lot of people – sometimes, they try and find short cuts, the easy way out. You know thatâ€™ll get you only so far, but if you have a work ethic thatâ€™s strong, to be a go-getter, thatâ€™s really what separates the boys from the men. Thatâ€™s gonna give somebody longevity in the game. Thatâ€™s what I hope to have. Format: Would you say that that maturity and attitude comes forward on Fast Life? Paul Wall: For me, I have an album coming soon out but it ainâ€™t about that album, itâ€™s about my whole career. Iâ€™ve been in the game for 10 years and Iâ€™m gonna try and be here for another 10 years. Format: How is the rap game in Houston these days? People Iâ€™ve spoken with seem to think things kind of fell apart some years ago. Crews broke up and people werenâ€™t getting new record deals, so has the scene been rejuvenated in recent times? Paul Wall: What? I donâ€™t think itâ€™s something in particular, I think itâ€™s got to do with the economy being the way it is, the music industry being the way it is, but a lot of people had their ups and downs, um, but a lot people have got new deals. Format: So who are the players these days and how have they influenced the scene? Paul Wall: Well a lot of people have new deals, you know, Slim Thug has a new deal, Lil Keke has a new deal with Universal and a new album heâ€™s working on, I got my new album coming out you know. Weâ€™ve had our ups and downs, but weâ€™re more independent, thatâ€™s our background so thatâ€™s what weâ€™re used to, the grind of things. Format: Would it be you opinion then that the scene is as healthy today as itâ€™s ever been? Paul Wall: Well, you know, overall the economy is down and a lot of the music industry is down. Sheryl Crow was on TV complaining about record sales so that lets you know, weâ€™re not experiencing anything special here, itâ€™s across the board. Like I was saying, as long as you adapt to it and put that hard work into it, I think youâ€™re going to reap the benefits of that success. You canâ€™t sit around and wait for someone else to do the job for you, you got to go out, you got to grind, you got to go out and get it. Format: It would seem then that the climate is just right for the mixtape revolution. Paul Wall: Well it gives you more freedom, it gives you free-reign to do what you wanna do on mixtapes. You can be more raw, you donâ€™t have special rule you got to abide to, you can do any kinda song you want on any kind of subject. Thatâ€™s not the same kinda pressure that comes with an album. Format: Ok so you mentioned earlier work with Travis Barker and Iâ€™m wondering how the Expen$ive Ta$te project, with Travis and Skinhead Rob, is coming along? Paul Wall: Well we met a while back, we became pretty good friends and after The Transplants broke up, we decided to do some music together, kinda just for fun. But Atlantic Records, the label I was on, didnâ€™t want to pick the music up, they didnâ€™t want to do anything with it, so they kinda put us on standstill until my contract with Warner Music came up. You know, whenever it comes up, maybe weâ€™ll do something, but right now weâ€™re concentrating on clothes. Format: So which came first, the clothing or the group? Paul Wall: We started making the clothes to promote our group, and it started being really successful for us to the point where we started coming up with different designs and making it a fully-fledged clothing line. Itâ€™s been pretty successful for us; our focus is now more on clothing than music though. Format: Cool, sounds pretty solid. So – to change the focus to your tattoos for now, can you tell us a bit about your ink? 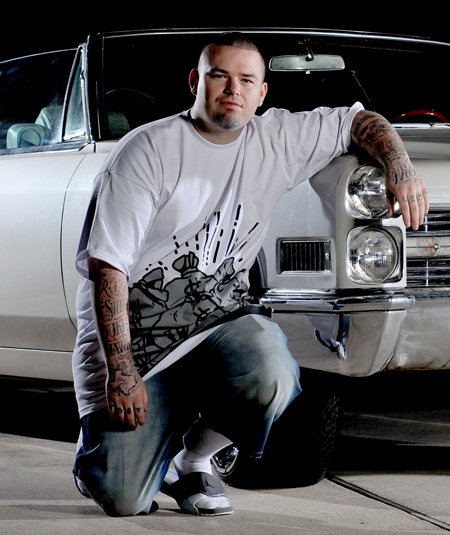 Paul Wall: Well, Iâ€™ve been getting tattooed for about 10 or 11 years, at first most were on my upper arms and chest. In Houston thereâ€™s a world famous tattoo shop called Dagoâ€™s; theyâ€™ve done tattoos for people like 2Pac, Dennis Rodman, Marilyn Manson, you know – all the Houston guys. A lot of famous athletes. You see the tattoos they did for 2Pac, they did some of his more famous tattoos. Thatâ€™s where I got my first tattoo and I still go to them to get tattooed, a guy by the name of Junior did a lot [of them] for me. Format: You also have a bunch of work done by Mister Cartoon. Paul Wall: Yeah, I got to be pretty good friends with the world famous Mister Cartoon, and when I had the opportunity to have him do the lower portion of my sleeves, you know I jumped all over that. And one by one, he just started filling it up; it might have seemed like it happened overnight but it was a process that took about a year; seeing him every now and then, going back with different ideas. Format: So you and Cartoon are pretty tight, then? Paul Wall: Definitely, heâ€™s a real good friend. In fact, he came up with the design for our first logo, our main logo for Expen$ive Ta$te and he came up with the Paul Wall logo on my last album too. Format: Are you adhering to a specific theme or style with your ink? Paul Wall: I like the Old English script type of style, thatâ€™s one of the things Cartoon specializes in. Format: And what does your ink say about you, if anything? 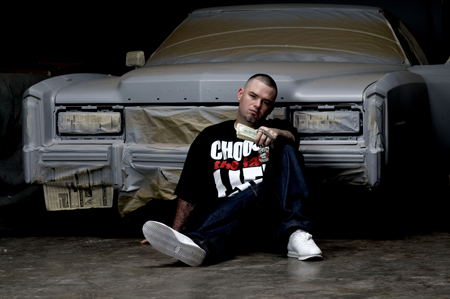 Paul Wall: Some of them symbolize things Iâ€™ve been through. I have one that says â€œBroderick Brown – Freedomâ€ itâ€™s a constant reminder of one of my homeboys, a childhood friend, who is in jail doing 45 years. Also, I have [an outline of] Texas on me because thatâ€™s where Iâ€™m from. I think growing up in Texas, youâ€™re born with a real sense of pride; you want to represent Texas â€˜til the end. Iâ€™m a real big fan of the Codeine, so I have a white cup on me that says â€œHalf Empty, Half Full.â€ That symbolizes, you know, I got a real positive outlook on life, I look at my cup like itâ€™s half full! Format: Cool thatâ€™s probably about everything, is there anything peeps should know about the future â€“ tours, collaborations, mixtapes etc? Paul Wall: Nah man, thatâ€™s it; you got it all right there.